On this date in 1943 in Quebec, Canada, President Franklin D. Roose­velt, British Prime Minis­ter Winston Chur­chill, and Cana­dian Prime Minis­ter Mac­kenzie King, along with their Com­bined Chiefs of Staff, set to work plan­ning Oper­a­tion Over­lord, the 1944 in­va­sion of Ger­man-occupied France. 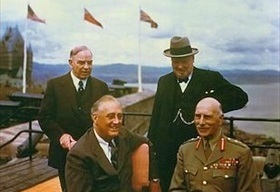 At this first of two Que­bec con­ferences, code­named “Quad­rant” (August 17–24, 1943), the leaders dis­cussed the con­tinued build­up of U.S. forces in Brit­ain prior to kicking off Opera­tion Over­lord, as well as steps to be taken in the bombing offen­sive against Ger­many that would hasten the col­lapse of the enemy’s econ­omy, its armed forces, and civil­ian morale. In view of the Allied inva­sion of Sicily (Opera­tion Husky, begun July 10, 1943) and the cur­rent inva­sion of main­land Italy (August 11–17), the leaders resolved to focus even more resources on extracting Italy from the Axis alli­ance. (An Italian armis­tice was soon signed on Septem­ber 3.) A repre­sen­ta­tive from China also attended the talks. One mea­sure the conferees settled on was to esca­late Allied mili­tary opera­tions in the Far East, which appeared to have been short-changed. This resulted in the reor­gani­zation of the Allied South-East Asia Com­mand. SEAC’s new directive was to intensify opera­tions against Japan in an effort to exhaust enemy resources by cutting com­muni­ca­tions lines between Japan and its over­seas con­quests, as well as to secure for­ward bases in China and the Paci­fic from which the Home Islands could be attacked by long-range heavy bombers. Another mea­sure agreed on by Roose­velt and Chur­chill resulted in the secret Que­bec Agree­ment, signed on August 19, 1943. The agree­ment mandated joint coop­er­a­tion in devel­oping the atomic bomb and mutual con­sent before either party used nuclear wea­pons. Almost two years later at the victors’ Pots­dam Con­fer­ence (July 17 to August 2, 1945), held on the out­skirts of Adolf Hitler’s former Reich capi­tal, Roose­velt and Chur­chill agreed to use the atomic bomb, suc­cess­fully tested on July 16, 1945, in the New Mexico desert, on the last Axis hold-out, Japan. Two atomic bombs oblit­er­ated Japa­nese cities, Hiro­shima on August 6 and Naga­saki on August 9. Between the two cities, 180,000 peo­ple died in an instant. On August 14, 1945, Japa­nese Emperor Hiro­hito (post­humously referred to as Em­peror Shōwa) surren­dered his coun­try (the surren­der was made public the next day in a nation­wide broad­cast), though it was not until Septem­ber that Japanese forces in Southeast Asia finally conceded defeat. Left: On the terrace of the Citadel in Quebec, Canada, during the Quadrant Con­fer­ence (or First Quebec Con­fer­ence, August 17–24, 1943) are Prime Minis­ter of Canada Mac­kenzie King, Brit­ish Prime Minis­ter Winston Chur­chill (standing), Presi­dent Franklin D. Roose­velt, and the Earl of Athlone, Alexan­der Cam­bridge, Gover­nor Gene­ral of Canada. The Citadel is the official residence of the Governor General of Canada. Right: In a decision taken at the Quadrant Conference, the Allies created the com­bined South-East Asia Com­mand (SEAC), which assumed over­all stra­tegic com­mand of all air, sea, and land opera­tions of all Allied forces in the Asia Pacific region. 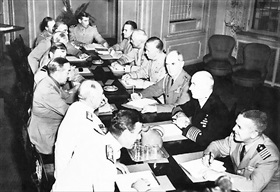 With the agree­ment of the Com­bined Chiefs of Staff for the West­ern Allies (formed in Febru­ary 1942), shown seated around the table in this photo taken on August 23, 1943, Vice Admiral Lord Louis Mount­batten (fore­ground, leaning for­ward) was appointed Supreme Allied Com­mander South East Asia, a post he held until 1946. U.S. Gen. Joseph Stil­well was First Deputy Supreme Allied Com­mander and headed the U.S. China Burma India Thea­ter (CBI) com­mand. Com­mand arrange­ments in SEAC were always com­pli­cated (Stil­well was recalled in Octo­ber 1944), and Mount­batten had nothing like Gen. Dwight D. Eisen­hower had in the form of SHAEF (Supreme Headquarters Allied Expeditionary Force) in Europe.